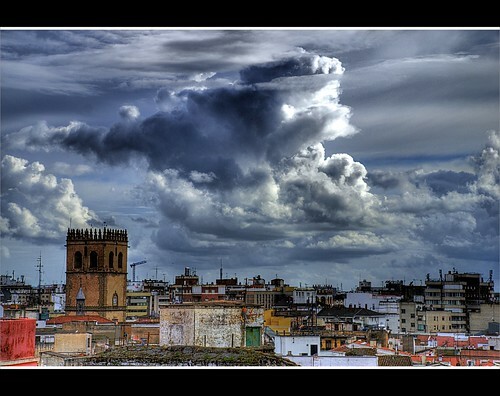 A few years ago I was living near Cádiz on the Costa de la Luz. I had made the break from U.K., wound down my business there, started another one here and was enjoying the Spanish lifestyle. But the area started getting popular with foreign buyers and while I enjoy English newspapers and English beer as much as the next person I did not want to live in a British expat community. Although nothing like as bad as my days on the M25, the traffic was nevertheless getting busier so I decided it was time to move further inland in search of the real Spanish way of life. I had heard of Extremadura but like most foreigners (and, it turns out, most Spaniards) I knew nothing about the region. I had heard vague rumours that it was a land of extremes, unbearably hot in summer and freezing cold in the winter, or at least that’s what the name suggested. But I decided to see for myself. I drove up round the Seville ring road, through the beautiful Sierra de Aracena and soon found myself at the border and crossed into Extremadura. I have to say my first impressions were not that great. I was struck by the absence of cars and people and while the countryside was pleasant enough it did seem rather flat and uninteresting to me, so I pushed on towards Zafra. Here things changed considerably. The countryside became more beautiful and rustic and there were hills to break up the skyline and, to my surprise, a huge lake or two. As I crossed the river Guadiana at the historic Roman town of Mérida I found myself in another world; a world of traditional Spanish living and customs, with hardly any foreigners, very few tourists outside of the main towns and above all a land of glorious countryside, and much greener than I was expecting. I saw birds I couldn’t recognise and stork nests everywhere and many animals grazing on the pastures – sheep, cattle, goats, and black pigs. And the weather was like a beautiful summer day in England (this was late March). Where, I wondered, were the extremes? I soon learnt that the name Extremadura simply means the land at the end of the river Douro and has nothing to do with extremes of any sort. Extremadura is an autonomous region of Spain and consists of two provinces; Badajoz (Spain’s largest) to the south and Cáceres (the 2nd largest) to the north. Extremadura is a very large region; roughly the size of Switzerland or the Netherlands, but it is very sparsely populated with only a little over a million inhabitants, roughly a quarter of who live in the three main towns – Badajoz, Cáceres and Mérida. Situated close to the Portuguese border, Badajoz is the most populated city in Extremadura with approximately 150,000 people. Because of its geographic location it originally gained prosperity through its links with Portugal but it has been the subject of bloody conflict over the years, including in 1812 when Arthur Wellesley (the future Duke of Wellington) successfully stormed the city. Today it is the administrative capital of Badajoz province. 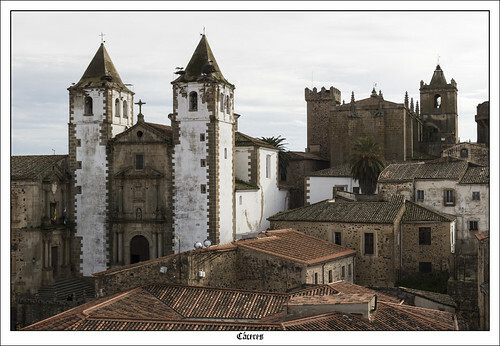 Originally founded by the Romans in 25 BC, Cáceres was declared a UNESCO World Heritage site in 1986 because of the great mix of cultures that can be found in the town. A perfectly preserved medieval old town (Ciudad Monumental) looks exactly as it did hundreds of years ago and many films have been made here. Cáceres was a candidate for the European City of Culture in 2016. If you had been a successful centurion in the Roman Army, Mérida is where you would have gone to retire after your years of fighting across Europe; it was one of the most important cities in the Roman Empire. There are more Roman monuments here than in any other part of Spain and the town was designated a World Heritage site in 1993. Today Mérida is the capital of Extremadura. Extremadura is split from east to west by two large rivers; the Guadiana which flows through Mérida and Badajoz and the Tagus which flows just south of Navalmoral de la Mata and heads to Alcántara. Both of these rivers flow into the Atlantic in the Lisbon area and both have many lakes and reservoirs and are a haven for wildlife, especially birds and fish. The Tagus in particular flows through some dramatic gorges in the Monfragüe National park where birds of prey circle high overhead. Some people enjoy fishing and sailing on the lakes but as there are very few people here the area is never crowded, even in the middle of summer or on public holidays. There are many restaurants where you can enjoy a leisurely meal by the water’s edge as well as lots of picnic sites for less formal al fresco dining. The area to the south of the Guadiana is relatively flat although it becomes hillier as you approach the Portuguese border. Between the rivers (about 120–130 km) the countryside is very lush and beautiful and pretty much untouched by modern day farming methods. To the east of the central part are the hills of the Sierra de Guadalupe and yet another World Heritage site, the Royal Monastery of Santa María de Guadalupe, the most important monastery in Spain for four centuries in the Middle Ages. To the west are the hills leading to the Portuguese border and the pretty town of Alcántara with another huge lake and its famous Roman bridge. North of the Tagus the country is hillier, sometimes even mountainous, ranging from the Sierra de Gata in the north west to the Sierra de Gredos in the north east. Also in the north east is the Valle de Jerte and La Vera, home of thousands of cherry trees and a riot of blossom in the spring. If you don’t like cherries, this is a place to avoid! Being such a large place, the weather varies across the region. Hot in summer but not unbearably so, especially if you live life the way the locals do. People aren’t around much before 10am and everyone goes off to lunch at 2pm followed by a long lazy siesta. They reappear around 5-6pm and generally enjoy the warm summer evenings until quite late, especially at fiesta time! And the humidity is very low so it’s not uncomfortable as it can be in other parts of the world with high temperatures in the summer. We have a very healthy climate here. The houses here in Extremadura, especially the old houses, are designed to keep the sun out; many have thick walls and fairly small windows with quite possibly no windows at all on south facing walls. Some people have air conditioning but personally I have never found it necessary although ceiling fans are definitely a good idea in the middle of summer. If you live close to one of the lakes, or in the hills, you will generally find it slightly cooler than in one of the country areas as there will often be a gentle breeze. Rain varies quite a lot. In the north and in the hills generally there will be more rain than in the other areas but this will mostly be confined to winter although a summer thunderstorm is not unknown. In the rest of the area you can virtually guarantee no rain from May to September and when it does come in the winter it tends to rain fairly hard for a few days and then the sun comes out again. None of those horrible grey drizzly days that used to depress me so much in the U.K.! Even in the depth of winter, if the sun is out, which it is more often than not, it is still plenty warm enough to enjoy a drink or a meal outside at lunchtime. Snow and extremes of weather are virtually unknown here, although they do get some snow on the hills of the Sierra de Gredos, and only the occasional frost before the sun melts it. The people can be summed up in one word. Friendly. Or, better still, in two words, extremely friendly. Outside of the main towns in the villages, people still live life the way they have done for many years. Everyone knows everyone else (and many of them are related) and although most people do not speak English or any other foreign language you will be surprised at how well you can communicate with the odd word of Spanish, a few hand gestures and lots of smiles. When you move into your new home you will find the locals will call round to say hello, often bringing gifts such as a box of tomatoes, some vegetables or a couple of bottles of home made wine. Many of the older people here have lived in Extremadura all their life and don’t see any reason to go anywhere else except on very rare occasions. Lots of people have never been outside Spain and for some a trip to Madrid is a real adventure. They are simple country folk who set great importance by the family; you will often see three or even four generations enjoying lunch together and joining in the general celebrations when it is fiesta time – as it often is! Firstly, let me start with what we do not have. No urbanisations, no apartment blocks, no property developers. There is some building going on in the main towns but this is usually housing for the local people, often subsidised by the Government. The rest of Extremadura is totally free of the sort of over-building that has so blighted other parts of Spain. No illegal property here, although a lot of the houses are currently unregistered as they have been in the family’s hands for many years, but this can almost always be rectified by a lawyer (at the owner’s expense) before the house is transferred to any new buyer. And certainly no land-grab problems here, partly because there are no developers to do the grabbing and land is not something that Extremadura is short of! Why not considering buying some land and building a new home in Extremadura. Property here, especially in the villages and the country, will often need modernising. It is quite common to find bathrooms and kitchens in the patio rather than the main house and many of the houses have an undeveloped first floor called a doblado. This was used for animals during the winter and many of the older houses have animal feed bins in the unused space in the doblado. Houses in the towns and villages all are or can be connected to mains electricity, mains water and mains sewage and usually, unless it is a very small village, a telephone line with a reasonable internet connection is available. In the country there is virtually no mains water so everywhere has a well or maybe two. This isn’t a problem, there is plenty of water here, you simply turn on your tap and the water comes out just as it would if you had mains water – and it is free!. Some country houses are connected to the mains electricity and some aren’t. They are often only used by the family for a few weeks in summer so they haven’t bothered to have mains electricity connected. This can sometimes be done if the pylons are not too far away, or there is always the option of solar power – a very viable alternative these days – for which grants can be available. Standard landline telephones are not generally available in the countryside although special TRAC phones can usually be obtained that charge normal landline rates, but most people tend to use mobiles. Internet connection by dongle is available although the connection would probably not be broadband status. If you need a faster connection in the country internet by satellite is also available. The road system here is excellent with a large network of main roads and a few motorways – these are virtually empty and toll free. Driving here is a pleasure not a chore! Where the nearest airport is will depend on where you live in Extremadura, but it is likely to be some distance away. Madrid is often the closest, with other possibilities being Seville, Valladolid or even Lisbon. If you are visiting you will almost certainly need to rent a car at the airport but many people living here use the express buses to Madrid or Seville from the main towns to avoid having to park at the airport when they go away. There is a brand new International airport being planned 17km south west of Cáceres but this is some way off now, due to the economic crisis. So wherever you live you are likely to be some way from the airport. Some see this as a disadvantage but personally I see it as part of our insurance that this part of Spain is not going to be invaded by lots of foreign buyers as has happened elsewhere, and is therefore likely to stay pretty much as it is today – quiet, peaceful, rural, with a slow and relaxing pace of life. An internal airport at Badajoz has flights to other parts of Spain. There is a train network which covers part of the region with services to Seville, Lisbon and Madrid but it is not extensive. Spain has a very efficient high speed train – the AVE – which goes from Lisbon to Madrid but does not currently come through Extremadura but this will change; they are currently building a new track which will connect Spain’s two biggest cities via Badajoz, Mérida, Cáceres, Plasencia and Navalmoral de la Mata. If you live some way from the train network there are many scheduled coach services which can be a very convenient way of getting around. And once you have lived here for a while you will probably find that there is a local taxi who will do airport trips at a ridiculously cheap price, as long as he has other passengers and you don’t mind sharing. The whole of Extremadura is a haven for wildlife. The virtual total lack of building development coupled with traditional farming methods has meant that wildlife habitat here has not been threatened and many species of animals and birds live here in relative safety or visit regularly. conscious of how unspoilt the area is and just how much diverse wildlife lives here. Even outside the national park you will see a host of different birds. Bird watching is very popular here, the main season is March to June but they can be seen all year round. You drive along a quiet lane and you suddenly see an explosion of brown and white stripes; a hoopoe was feeding in the verge beside the road. Every year thousands of cranes arrive to fatten up on the acorns around the lakes of las Vegas Altas before continuing their long journey to their summer home in Scandinavia. And if you are lucky you may even see the Great Bustards strutting their stuff just outside Trujillo. The lakes to the south of Trujillo in las Vegas Altas are teeming with fish, but with very few fishermen! Sorry to disappoint you but there are none! At least, not the sort of night life and beaches you normally associate with the Costas. We are the best part of 4 hours from the nearest beach and other than a few local establishments in the cities, the same distance from the nearest night club. So if lazing around on a beach and clubbing all night is what you are looking for, I’m sorry but Extremadura is not for you. But if your idea of night life is a quiet drink or two and some tapas in a beautiful historic square watching the storks as they nest on the nearby roofs and generally relaxing and chilling out, before a meal of traditional Extremadura food, then this is definitely the place to be. If you really want a beach, many of the lakes have them and especially in the summer you will find them very well patronised by locals enjoying the balmy summer evenings. Some beaches even show movies at fiesta time, or provide live music and dancing, usually free of charge. Most villages have their own municipal swimming pool which is very popular in the summer and, especially in the Sierra de Gata and La Vera, many local authorities have created designated natural swimming areas in the rivers for people to enjoy, usually with a bar or café attached. So, to sum up, Extremadura is a very quiet, peaceful, traditional part of Spain where life is lived at a slow place, pretty much in the same way that it has for hundreds of years. It is very beautiful, historic, uncrowded and likely to remain that way. I hope this article has given you an idea of what Extremadura has to offer but don’t just take my word for it, come and see for yourself. 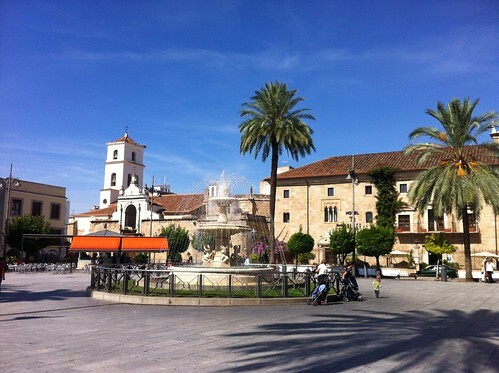 I recommend a few days in one of the historic towns wandering round the old streets, meeting a few locals, trying out your Spanish and sitting in a beautiful square watching the world go by – slowly! It’s called market research! This guide to Extremadura has been written by a regular contributor to our website, Martyn Swan, of Extremacasa. ExtremaCasa SL is the only fully registered British owned estate agent with properties for sale throughout the whole of Extremadura, which is a large area, the size of Switzerland or Holland. The owner is Martyn Swan who has a wealth of experience with property in Spain. ExtremaCasa are based in the beautiful medieval town of Trujillo, with a number of other people in different parts of the region who look after our clients and properties in their area exclusively for us.